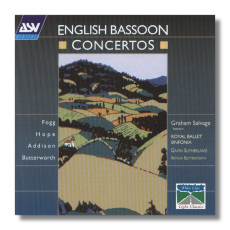 This is the second disc in an interesting series featuring modern British works for wind instruments and chiefly, chamber orchestra. Of the four included here, I was very much charmed by the Fogg piece which reveals an innate sense of discovery and lavish love for this often misused instrument. John Addison's Concertino is also exploratory and devises several ways for the bassoon to sound like a violin, especially in the quaint Larghetto. Hope's bombastically titled Concerto 2000 is one of those many millennium pieces which are now dating rather badly after the frenzy of commercialism and the aftermath that was this year! The final work is a curious combination of both melancholy and lyrical beauty with a lovely third movement titled, "The lament of the Summer Wind". Arthur Butterworth's music is full of the contrasts and thrills and he may be counted as one of the best composers currently operating in England. Graham Salvage is a mannered exponent of all four works and he receives committed support from Gavin Sutherland and the Royal Ballet Sinfonia. The White Line mid price tag also encourages first time buyers to experiment with unfamiliar but ultimately, rewarding repertoire.